Nic Beuret's account and analysis of the TUC-organised March for the Alternative on the 26th of March - in his own words, "What happened on the 26th and why did it leave so many with such an empty feeling?" Originally published in May 2011. The march on the 26th was significantly larger than had been anticipated when the Trade Union Council (TUC) reluctantly called it last year. The TUC’s complicity with the human rights organisation, Liberty, and the Metropolitan Police around the management of the protests was born of a particular fear – one that may still come to pass. Their fear was (and is) that the mass of bodies on the march would not merely flow smoothly into electoral politics but instead move beyond it into some realm of civil disobedience. They fear that we will move past the existing consensus that organises our lives and become ‘ungovernable’. In many ways their fear is justified – disobedience is becoming attractive and the impotence of electoral politics (and the bankruptcy of the Labour Party) is patently clear. Since the global downturn began there has been a return of workplace occupations and wildcat strikes in the UK, and a series of uprisings and revolutions around the globe. Their fears were heightened by the militancy of the student protests last year and the actions inspired by groups like UK Uncut as well as the range of disobedient struggles by groups defending libraries, nurseries and other services and spaces. The sheer scale of numbers involved in the march speaks to the powerful potential for disobedience and resistance. On their own, however, numbers are just one public relations element in the electoral cycle; fodder for headlines, opinion polls, party manifesto promises and back-room deals - much like the Iraq war protests of 2003. Complicity with the police was the only possible response to the not-yet disobedient mass, to contain it and direct it towards acceptable political spaces and ward off any possible contagion from its proximity to more radical forms of politics. In many ways the moment of fear may have passed, in part because the radical left failed to make the most of the potential on the day. Disobedience is not the preserve of the radical left. Disobedience and resistance are both continually coming into being throughout society. But the tides of rebellious desire, spontaneous in their eruption, also tend to ebb without channels within which to flow. Spontaneity and organisation have a necessary (if conflictual) relationship – in whatever form they take (gang, collective, union, party, social network, etc) – that is necessary for substantive social transformation ‘from below’. The radical left has an important role to play here; not as leaders but as co-conspirators, comrades organising resistance through their proximity to other potentially rebellious bodies. The two main co-conspiratorial bodies on the day – UK Uncut and Black bloc - both failed to make something more – more disobedient, more radical, more disruptive – out of the day. UK Uncut because of their organisational and political limits and the Black bloc because of their separatism and misjudged theatre of militancy. Somewhere in the order of 4,000 people headed off from the TUC march towards Oxford St on the 26th. However singular and distinct they were, their actions were largely conditioned by the narrative (political and organisational) of UK Uncut, and a much smaller number as a part of the Black bloc. So while the radical left in general can be said to have fallen short of what was possible, particular attention has to be paid to the two ‘groups’ that demarcated the disobedient space on the day. After March 26th it is clear that UK Uncut has reached its political and organisational limit. Beyond the critique of the ‘leaderless network’ form adopted by them over the last year, their network on the day failed. By all accounts the dispersed actions were poorly coordinated and left largely to the initiative of individual groups who lacked the means to effectively communicate between themselves. The main occupation on the day was so badly organised that several of the groups, organised by flag colour, were ‘led’ by people who didn’t know where they were going or what the action was. This lack of organisational capacity speaks to a larger problem. Calling UK Uncut a ‘banner that actions can take place under’, a network that needs no further coordination or leadership of any kind, both mystifies the actual organisational processes that are at play and works to inhibit the development of other forms of coordination. UK Uncut is clearly not leaderless - it is obvious that there are some core personnel narrating the story via ‘owned’ communication channels and by the dominance of their voices both within the network and publicly (manifesting an invisible hierarchy of the most unreconstructed kind). All this is enabled by the rhetoric of a leaderless network. There is no such thing. All structures have spaces, processes or bodies that have more or less access to power than others. The important question is not whether or not there are leaders, but how power is distributed and decisions made. If the problems with UK Uncut were purely organisational, it would be easy enough to call some form of spokescouncil (as in the days of the anti-globalisation movement), or arrange some form of participatory democracy or delegate structure. We can speculate that perhaps the fact that this hasn’t happened echo’s some of the similarly problematic processes within Climate Camp – a political precursor to UK Uncut. It also points to the urgent need to analyse the NGO-ification of social movements in the UK. But the problems of UK Uncut go beyond organisational forms and into its political content. Firstly, it rests on a false assumption - one that moves people back towards the kind of policy-driven politics that the TUC favour. The basic political ‘ask’ (to use the NGO concept that underpins so much of the strategy of UK Uncut) is that if all the tax that large corporations avoided was paid there would be no need for cuts. The problem with this is that the cuts are not necessary per se (i.e. for purely economic reasons, as evidenced by the variety of economic strategies being pursued by other neoliberal governments) – the cuts and restructuring are political and would still be taking place if the tax was paid. Targeting ‘unpaid’ tax reinforces the idea that it is this ‘missing’ money that is the problem and ignores the immediately political nature of the restructuring. Secondly, targeting tax avoidance as a practice accepts the reduction of politics to economics. Part of the neoliberal project is to reduce politics to a narrowly defined species of economics. Individual responsibility and a belief in the market as a fair mechanism for distribution are both essential to neoliberalism. Fighting the political reordering of society by calling for companies to play fair ‘just like us’ leaves this form of politics intact. What UK Uncut is calling for is mere correction, one brought about by a (very) ‘civil’ disobedience. Finally, the main actor prefigured in UK Uncut’s actions is the ‘good citizen’ – one who does the right thing, who pays their taxes, participates and above all believes. This wholesome figure, if it ever existed, is certainly fracturing under the weight of the crisis. This is exactly where the outrage and defiance we have seen over the last six months comes from, with the betrayal of the old form of citizenship and aspiration, of the promise of social mobility and the payout on entrepreneurial activity. Using this figure reinvigorates what is now a false constituency and misdirects people’s anger and rage. What attracts people to the actions of UK Uncut is something that many seem to instinctively grasp as appropriate to the moment – the occupation. The occupation as an idea has been bubbling up through the imaginary within the UK – from Climate Camp to the numerous workplace occupations that have taken place over the last three years, as well as examples from Greece to France and Tunisia to Egypt. Occupation has a strong grip on our imagination of disobedience. It is this that we should take from UK Uncut - people recognise it as an appropriate tactic for this moment and one that speaks to our reappropriation of time and space. The terrain of the 26th was marked out by two different forms of protest that both led back to existing political forms of expression, both aimed at reform and both ultimately correlated to a reduced constituency. What we saw was a mass of bodies from a range of networks, organisations, groups and tendencies take part in these two spaces. While the potential existed within this disparate multitude to go beyond the limits of the TUC march and the UK Uncut spectacular occupation, on the day this did not manifest itself. Hope lies with some of the actions and forms that emerged before the 26th – such as the university occupations, the local anti-cuts actions and town hall ‘riots’, the various service actions and campaigns around childcare and the NHS. This hope requires that people quickly recover from the fact that while most organisations were building for the TUC march or actions on the 26th, few had any plans for what comes next. Despite a vast amount of the radical left proclaiming otherwise, the latest neoliberal restructuring of our lives is not a re-run of the Poll Tax. It is in fact completely different. Our parallel is not with the Poll Tax but with the Structural Adjustment Programs that until 2008 have been taking place in the global South. We need to look to the forms of resistance in South Africa, Mexico, Argentina and elsewhere, and not to the much-reified Poll Tax resistance and riot. According to those that took part on the day, at their height the Black bloc numbered around 500. While the boundaries between the Black bloc and the remaining mass involved in civil disobedience were not absolutely distinct, the Black bloc was a clearly demarcated form on the day, and needs to be analysed as such. Especially, it marked itself out as the militant anti-capitalist body above all others. On March 26th, as an alternative to both the TUC march and the UK Uncut inspired actions, the Black bloc’s propaganda of the deed had two implicit aims: to deepen and generalise the militancy on the streets and draw attention to a critique of capitalism through its choice of targets. The Black bloc failed on both points. The Black bloc does not represent militancy – this isn’t, but should be, obvious. Reviewing the various analysis and conversations surrounding the events of the 26th, it would seem that this is the perspective of many on the bloc. There were 4,000 people actively engaged in radical disobedience on the day and 500 on the bloc at its peak. The majority of the militants who have come out of the various protests over the last six months, many of whom engaged in property damage, chose not to join the Black bloc. This does not mean that they were any less militant for it. Militancy cannot be reduced to property damage, nor is property damage the most militant form of protest. As the history of Black struggles in the USA teaches us, sometimes taking a seat in the ‘wrong’ place can be the most militant action of all. Militancy has become generalised, and with 4,000 militant bodies in the streets, what was the point of the Black bloc as a separate entity? As a piece of militant and aggressive theatre it wasn’t needed to maintain visible antagonism on March 26th, or to develop the existing militancy out there on the streets. Nor did it generate ‘more’ militancy in the same way the Millbank riot in November 2010 did. Why? Millbank was a mass action – it wasn’t a self-defined group that smashed its way into the Tory HQ but a huge section of the demonstration. Its character as such made it resonate – it was open and undefined. The protests that followed had similar characteristics: huge sections of the crowd were involved in fighting the cops during December, for example. This open and undefined nature created spaces where bodies came together to find a common need for militancy. It was this free-for-all nature that generalised militancy; the open relationships in struggle without pre-definition beyond a shared anger and rage. And it is the closing down of this space that was the ultimate achievement of the Black bloc on the day. It is clear that the politics of the TUC and the old electoral left are long past being able to serve even reformist ends. 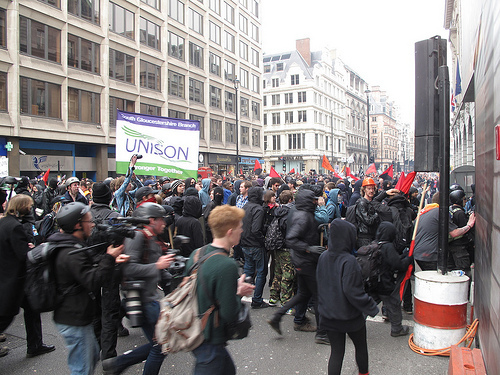 It is less clear what emerges beyond the politics of UK Uncut and the Black bloc. What was surprising was the lack of visible presence from the other main character on the stage in the lead up to the 26th – the students as a singular body. After all it is this body that made many think something more was possible. As individual occupations and groups they were there, but somehow their presence was not felt, not as a moment of rupture. Perhaps it was impossible that they could provide this moment on the day. Perhaps something else was needed. Or, perhaps, the day was made for something more subtle and quiet – a series of subtexts and whispers that ran between the lines and acts of the play. Nic Beuret is currently a member of The Paper collective and was on the buggy bloc with his daughter on March 26 (while his partner caused havoc in the city). He has variously been involved in a successful community nursery campaign in Hackney, resisting job losses as a shop steward in his workplace, local anti-cuts campaigning and No Borders activism in Australia over recent years.